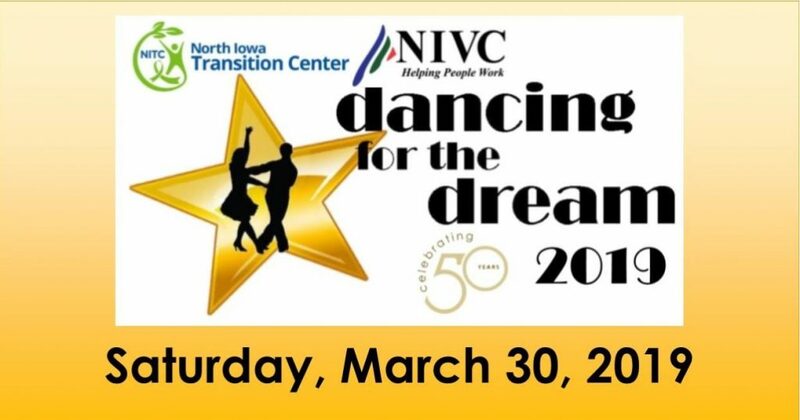 Mark your calendars for NIVC Services, Inc.’s 11th Annual Dancing for the Dream!! This fantastic fundraising event is returning to the historic Surf Ballroom (460 North Shore Drive, Clear Lake) on Saturday, March 30th! The event is from 6:00 pm to 9:00 pm! Do not miss North Iowa’s very own “Dancing with the Stars” contest with a fun 1969 flashback twist! Along with cheering on your favorite dancing duo, the evening will include delicious appetizers, fun live music from Nonsemble, and silent and live auctions! There are fantastic items up for auction, including Air Choice One tickets, sky box seats at an Iowa State University football game, an International themed dinner for 8, and so much more! All proceeds from this event benefit NIVC Services, Inc., a local nonprofit that helps persons with disabilities with job training and employment placement services. The work they do helps so many individuals and families throughout North Iowa. Dancing for the Dream serves as the organizations main fundraising event. Tickets cost $50 per person. They are available for purchase online HERE or by texting D4D to 41444. Please call (641) 423-3301 for inquiries regarding table reservations. Help support this truly worthy cause by attending this fun event! Check out our Website and follow us on Facebook for more great North Iowa community events throughout the year! Image Credit: NIVC Services, Inc.